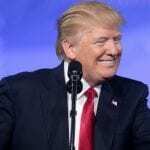 Trump Scores HUGE WIN In 9th Circuit, Court Says Trump Right, Asylum Seekers Can Be Sent To Mexico! Earlier this week, headlines were made when a 9th Circuit judge issued an injunction saying President Trump could no longer send asylum seekers back to Mexico. That made headlines and I bet you saw a bunch of them. On Friday, a higher court OVERRULED that ruling and said Trump is right. Trump can continue to send asylum seekers back to Mexico! I’m willing to bet you didn’t see that headline anywhere. But that’s why you have us at WeLoveTrump. BREAKING: The 9th Circuit Court of Appeals has ruled to uphold the Trump administration's policy on making asylum seekers wait for their court hearings in Mexico, as opposed to the United States. The administration has defended the policy as necessary to deal with what it calls an immigration crisis at the border that is overwhelming existing enforcement mechanisms. The lower court ruled earlier this week that the policy contradicted U.S. immigration law and issued a nationwide injunction but delayed its implementation to give the government time to appeal. The administration has sent more than a thousand asylum-seekers, many from Central America, back to Mexico as their asylum claims make their way through the U.S.’s backed-up immigration system. Trump has doubled down on his hard-line stance on immigration in recent weeks, threatening to close the border with Mexico, cutting off funding to El Salvador, Nicaragua and Honduras, and overseeing a purge at the Department of Homeland Security. Trump has said that many claiming asylum seek to do harm, saying last weekend some asylum-seekers should be "fighting for the UFC" and that approvals of asylum claims should be curtailed. "The system is full. Can’t take you anymore," Trump said while visiting the border earlier this month, adding that for both "illegal immigration" and asylum-seekers, the answer is "I’m sorry. We’re full." Do you like our creation?